The Associated Press named the Cubs winning the World Series as the top sports story of 2016. Aside from the fact that Captain Obvious must have been moonlighting for the AP sports department this year, there are two critical lessons that PR strategists can take from the Cubs championship season to play winning PR. 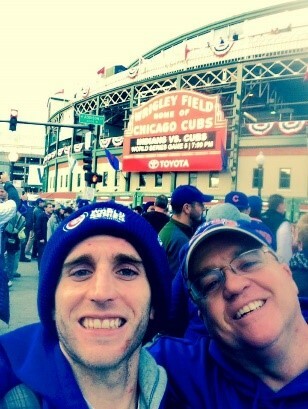 The author (right) with his son Jeff outside Wrigley Field before Game 5 of the 2016 World Series. Cubs were down 3-1 at this point but came back to win the Series 4-3. They had a plan, and stuck to it. When Theo Epstein became President of the Cubs, he was upfront with the fans. He said he had a plan but the fans would have to be patient. He was confident it would work. For fans (like me) of a team that at the time had gone more than a century since last winning the World Series, that was a big ask. But Theo stuck to his plan, as he sought to build a “foundation of sustained success.” He focused on building the pillars for future long-term success around younger players the team could develop in their own image, such as Kris Bryant, Anthony Rizzo, Addison Russell, and Javier Baez. A team built with the compass of a guiding philosophy that everyone buys into has a much greater likelihood of winning the World Series. And so it is in PR. In the haste to generate immediate leads for the sales team, a PR plan is slapped together with lofty and often unachievable short-term goals – Page 1 story in the Wall Street Journal, interviews on CNBC or Fox Business News, feature in the New York Times. But without first building the PR plan basics and getting everyone on the team to buy into the goals, those lofty aspirations will remain out of reach, especially if you are starting from a position far back in the standings of your industry. Basically, you’re trying to hit an 8-run homer to take the lead when you are behind 7-0 in the first inning, instead of think about how to move runners from base to base within your integrated marketing plan to put (and keep the) pressure on to take the lead in your market. Instead of swinging for the PR fences, start first by looking to hit some singles and doubles. Understand your priorities, where your fans (your prospects and customers) are, what challenges they have, what will interest them. Then build a strong content lineup that gets – and keeps – them circling the basepaths with you as they tap into your bench for your depth of industry knowledge as they make their purchasing decisions. That’s a proven winning PR strategy. The Cubs went through some tough times during Theo Epstein’s early years running the club. They lost 101, 96 and 89 games his first three years, as the team looked to unload the bad attitudes, the bad contracts and the bad fundamentals that had jinxed the team for decades. They were progressing, albeit slowly, and adjusting ever so slightly on the fly only when it made sense. Then Joe Maddon became available to manage the team. Maddon was a proven winner who worked with young players throughout his tenure in Tampa Bay, making repeat trips to the playoffs against much bigger-market teams with much larger payrolls, so the Cubs jumped at the chance to bring him in. They also added several playoff-proven veteran pitchers, even though their plan focused initially on young hitters. The time was right to go for it all. They were winning, but they adjusted on the fly and got even better. That’s what your PR team needs to do as well. There will be a lot of swings and plenty of misses as you look to see what scores with your prospects, but once you start making contact with the ball look to adjust the program to get even better. The unique buying personas who may be interested in your solutions may not swing at a webinar, but they may subscribe to your blog or pay attention to a particularly insightful infographic. Then start going for extra bases with more exclusive, deeply researched thought leadership pieces placed in major healthcare industry trade publications, or white papers distributed as part of an integrated digital marketing campaign. You may want to build on your winning streak with videos or a serial ebook that takes those leads being generated and keeps them coming back for more and more compelling content. Keep adding to your PR program based on what’s working, and don’t be afraid to trade off something that isn’t working for something new. 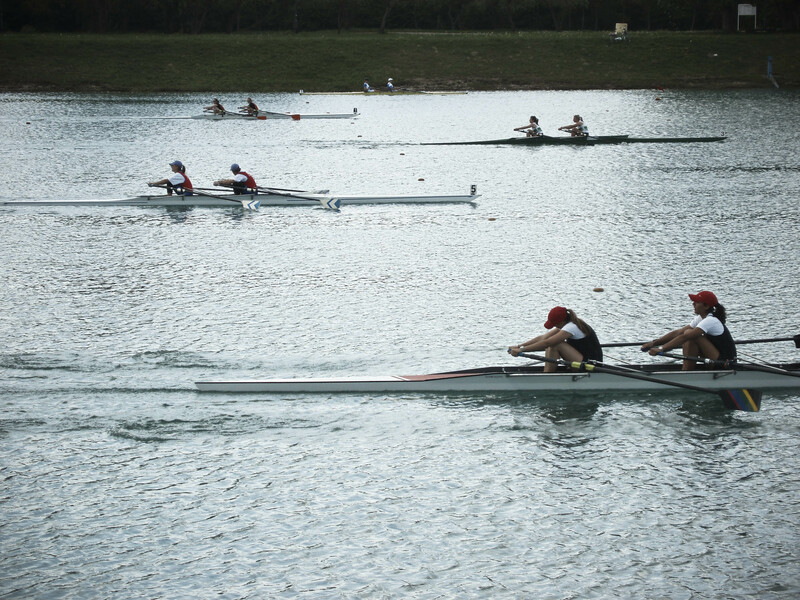 With PR, like any sport, practice makes perfect. But along the ways, bad things can and will happen. Your executive team can lose a key player, your organization may face a communications crisis due to a disgruntled ex-employee or dissatisfied customer, or an industry analyst may criticize your solutions. Bad things happened to the Cubs, too, late in the game against the Indians. The Cleveland team came from behind to tie the score, sending the game into the 10th inning tied. That’s when the most disappointing player on the Cubs, Jason Heyward, stepped up during a rain delay and reminded his team how good they were, that they were ready for what happened to them. And that they could win. And they did. The World Series. In my lifetime. I can die a happy man. By building your PR plan to be fundamentally strong, by not being afraid to try different things to see what works, by leveraging the depth of knowledge on your bench to create strong, compelling content – you too can be World Champions, in PR. Why should you write a book? Most busy tech executives have a hundred good reasons why they can’t spare the time for books. Their PR advisers may be tempted to concur since PR performance is judged largely on the quantity of placements secured. After all, why spend months writing one 80,000-word book when you could write 100 800-word articles for a variety of online publications? Yet a book’s value exceeds that of even dozens of articles. With a book, you can dive into your topic in much more detail than you ever could with online content. Sure, it might not sell but sales aren’t the point: books are tools for establishing you and your company as thought leaders. They’re magnets for relationship building. An expert who is confident and knowledgeable enough to set her expertise in stone with a book will win instant credibility in the eyes of potential partners, clients and customers. Books are assets that you can share with brand advocates, customers, prospects, investors, and industry stakeholders. Books can attract other opportunities to you and your company. Conference organizers, for instance, are much more likely to give a keynote to the author of a respected book—even if it doesn’t sell well—than to a book-less competitor. A book can build trust by positioning your company as having a knowledge-based environment, rather than one focused on sales alone. The key to making the most of a book is good promotion. At Amendola, while we don’t specialize in book promotion, we’ve learned over the years how to augment the distribution and promotion efforts of book publishers to drive PR value. Pitch the author as an expert on the topic, with the book as proof of their expertise. Broadcast media love interviewing authors with new ideas. Turn the book chapters into a webinar series, with each chapter or section a separate webinar. Give the book away as enticement to register for the webinar. Write a LinkedIn status update about the book and post a link to it in groups where prospects congregate. Include the book in your email signature, with a link to download it for free. If this short list helps convince you to write a book, give us a shout. We can help.